I made this soup for the first time on thanksgiving as an appetizer. I have since made it two more times because it so darned good! My sister who is not a huge veggie fan turned her nose up at it at first when she heard the words “carrot ginger soup”, but then dared to try a taste. She liked it so much she had the leftovers for lunch the next day. Sometimes a carrot soup can be too overpowered by the ginger but this recipe just has enough to tease you with the taste. 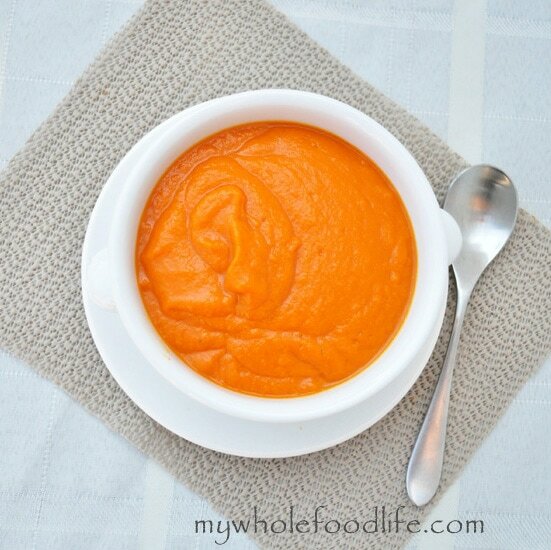 Great soup to try while carrots are still in season and so cheap! Add all ingredients to a large pot and bring to a boil. Reduce heat and simmer until carrots are soft. When done transfer to a blender and blend until smooth. Yum yum for your tummy.